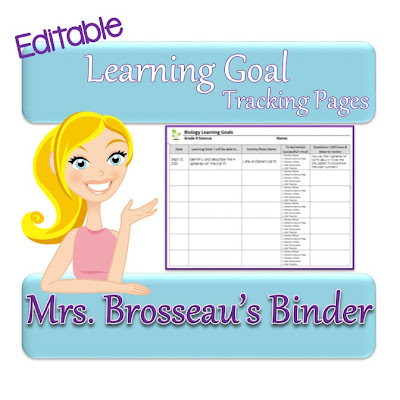 I am all about the learning goals! And when the kids ask what's on the test they know to look at them. Last year I started using a log for the students to track their learning goals, the notes and activities associated with them. Before class begins they know to copy down the date, learning goal and note/activity. We reflect on their progress to the goal before, during and after class begins with quick-checks (thumbs-up, thumbs-down), partner-checks (explain to your partner...), exit cards and tweet sheets just to name a few. If the kids are still struggling they've got options they can check to make sure they are able to accomplish each goal (ask a classmate, check online, go to Science Help, ask Mrs. B, etc). Finally, there is a place to write down any questions you still have. Sometimes, if the kids have a great handle on the concepts I let them draw a big smiley face in this area to show that they've got it! Thank you so much! That is such a great idea!